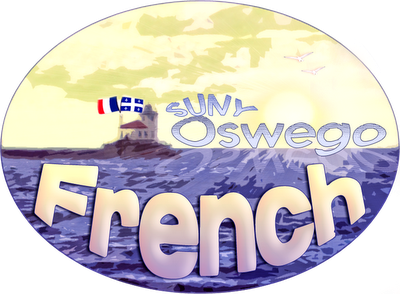 Lately I have not had much time for posting, as I have been busy with schoolwork and with this project: designing a logo for my university's French program and working to create a website and social network for faculty and students to interact on. I even created a Twitter account for it! I thought this might be of interest to those of you who are teachers. I know many of you already use these tools with your students, and I think they will work very well at the college level as well. When I am a high school teacher, I will surely do something very similar. Another project I am working on is Relay for Life. For those of you who aren't familiar, this is an event created by the American Cancer Society that takes place all over the United States. Organizations form teams and compete to raise the most money before and during the actual event. I am the co-captain of the Pi Delta Phi National French Honor Society team at this year's SUNY Oswego Relay for Life which will take place in April. Any donation you can make, even as small as $1 is greatly appreciated and goes towards cancer research! This semester I will be inducted into Pi Delta Phi, Theta Delta chapter. How did your Relay for Life go? I just finished my third year as a team captain this past weekend. Still sooooo tired!